Our product range includes a wide range of sigma mixer. In order to attain the maximum satisfaction of our esteemed clients, we are engaged in offering efficient Sigma Mixer. This mixer is used for mixing kneading, homogenizing wet pasty, rubber compounds and others. 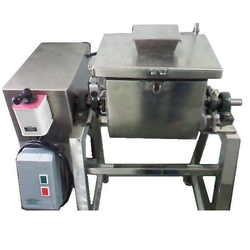 The offered mixer is suitable for textile dyes, pastes, pharmaceuticals, chemicals, rubbers and many more. Under the direction of skilful professionals, this mixer is engineered using quality approved components as well as contemporary techniques. We assure for the flawless nature, the provided mixer is rigorously examined against numerous practical parameters by our experts. Looking for Sigma Mixer ?